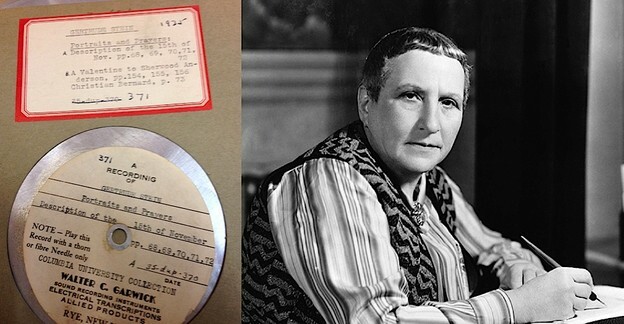 We urge readers of Jacket2 to look at — and listen to — Gertrude Stein’s PennSound author page, where new recordings have now been linked. Most who have encountered Stein’s mellifluous voice have heard it from Caedmon record TC 1050 (1956), either directly or via its digitization in PennSound. The provenance of these recordings, however, begins on January 30, 1935, when Stein visited Columbia University during her American tour. Most interestingly, perhaps, is that the Columbia professors who invited her, George W. Hibbitt and W. Cabell Greet, are the lexicologists and scholars of American dialects who founded and edited the National Council of Teachers of English’s Contemporary Poets Series, one of the first archives of poetry audio and for which these recordings were made. PennSound is making available here, for the first time ever, the master recordings that came to be released as the Contemporary Poets Series and the Caedmon record, unedited and containing commentary, false starts, and some previously unreleased tracks. A crucial facet of these recordings is the collection title: The Speech Lab Recordings. The reason that Greet and Hibbitt were in possession of the Amplion record creation device that could cut aluminum records is because they used it as a primary tool for their research: the study of American dialects. Indeed, most of the recordings that were made in the Speech Lab were of not of famous poets — they were of Columbia students and others from various American locales, recorded to study variants of the American idiom. The fact that the same collection title at Columbia University is used to reference the complete set of recordings, the dialect samples and the poetry recordings, is significant in demonstrating the ethnographic role of poetry, how it can serve as cultural preservation through sonic representation. It is also worth noting that the producer of these records, Walter C. Garwick, was the inventor of the portable field-recording device used by John A. Lomax for his famous ethnographic field recordings of cowboy songs and African American spirituals (see Chris Mustazza on the Contemporary Poets Series in Jacket2). And the Stein recordings fit well in this collection. In her comments on The Making of Americans, Stein notes, “[I]t was an effort to make clear just what I felt about the whole world and how it talked.” Stein’s explicit interest in a shared idiom and the fact that fragments of The Making of Americans make up such a large part of the recordings, should certainly be seen through the historical framing of this collection: that she was being recorded in a lab where speech patterns were studied. And, indeed, it was the same lab where Greet and Hibbitt recorded Vachel Lindsay, whose fascination with localism is well studied, and James Weldon Johnson, who worked to preserve the sounds of African American preachers of the early twenieth century in his seminal collection God’s Trombones. The recordings of Johnson and Lindsay, as well as those of Harriet Monroe, are available in PennSound. We at PennSound hope that releasing these recordings will help to elucidate the rich phonotextual history of the poems and the collection as a whole.